张凤, 韩利文, 张云, 韩建, 侯海荣, 王希敏, 刘可春, 田青平, 何秋霞. 氯氮平通过诱导斑马鱼胚胎心脏细胞凋亡引起心脏毒性[J]. 中国药理学通报, 2018, 34(8): 1088-1093. ZHANG Feng, HAN Li-wen, ZHANG Yun, HAN Jian, HOU Hai-rong, WANG Xi-min, LIU Ke-chun, TIAN Qing-ping, HE Qiu-xia. Clozapine induced cardiotoxicity in zebrafish embryos through apoptosis[J]. Chinese Pharmacological Bulletin, 2018, 34(8): 1088-1093. Abstract: Aim To observe the toxic effects of clozapine on zebrafish embryos and investigate the possible mechanisms underlying its cardiac toxicity. 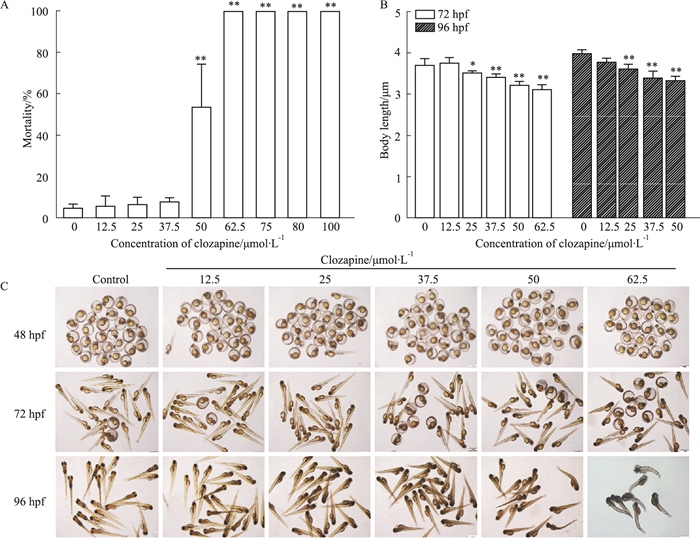 Methods Zebrafish of 24 hpf(hours post fertilization) were exposed to different concentrations of clozapine. After treatment for 24, 48 and 72 h, the heart rates of the zebrafish embryos were examined and morphological changes of the heart were determined. The mechanism of clozapine induced cardiac toxicity was preliminarily explored by means of acridine orange (AO) staining. 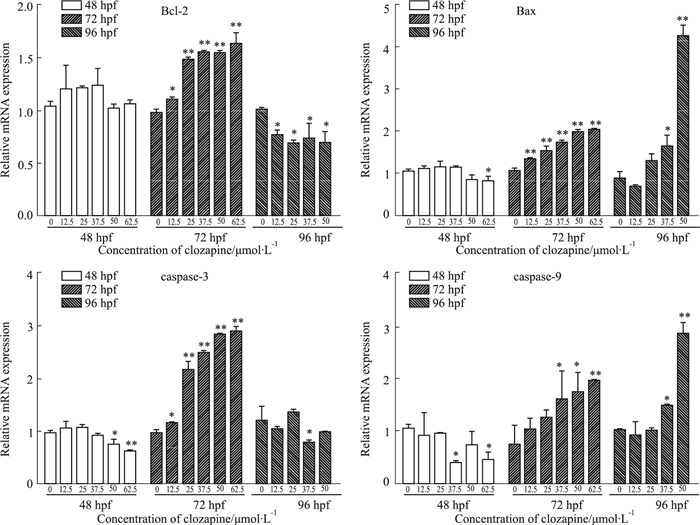 The mRNA levels of Bcl-2, Bax, caspase-9, caspase-3 were detected by real-time PCR analysis. Results Clozapine induced the decrease of body length, formation of pericardial edema, and decrease of heart rates of the embryos in a time and dose-dependent manner. AO staining showed that clozapine induced cell apoptosis of the cardiomyocytes. Real-time PCR analysis showed that the anti-apoptotic gene Bcl-2 was down-regulated and pro-apoptosis gene Bax was up-regulated at 72 h post treatment, resulting in the decreased expression ratio of Bcl-2/Bax. In addition, caspase-9 and caspase-3 were induced significantly by clozapine. Conclusions Clozapine caused cardiac toxicity in zebrafish embryos by inducing cell apoptosis. 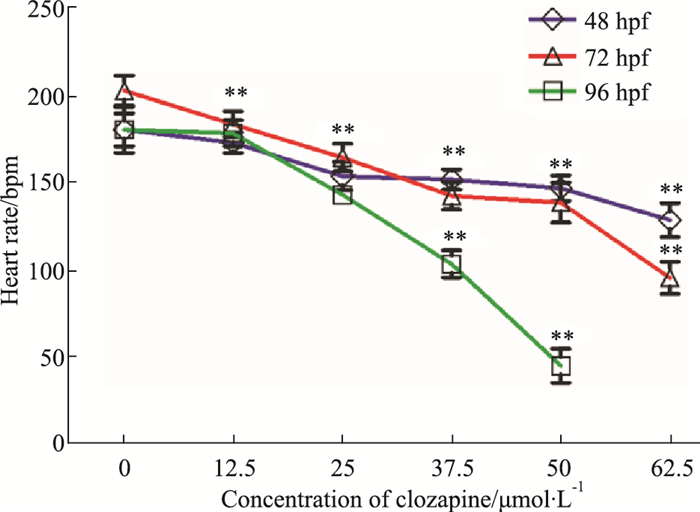 Fig 1 The mortality and morphologic response of zebrafish embryo to clozapine treatment A:The mortality of zebrafish embryos exposed to different concentrations of clozapine at 96 hpf (x±s, n=30);B:Effect of clozapine on the body length of zebrafish embryos(x±s, n=15);C:Effect of clozapine on embryonic morphological changes. *P < 0.05, **P < 0.01 vs control. Fig 3 Effect of clozapine on apoptosis of cardiomyocyte cell in zebrafish(x±s, n=15) A:Fluorescence photographs of all groups stained with AO; B:The ratio of the number of apoptosis myocardial cells in clozapine exposed groups and the control group. **P < 0.01 vs control. Layland J J, Liew D, Prior D L. Clozapine-induced cardiotoxicity: a clinical update[J]. Med J Aust, 2009, 190(4): 190-2. 王雪, 刘可春, 王希敏, 等. 大黄酸对马兜铃酸A引起的斑马鱼肾脏损伤的保护作用[J]. 中国药理学通报, 2016, 32(3): 361-5. Wang X, Liu K C, Wang X M, et al. 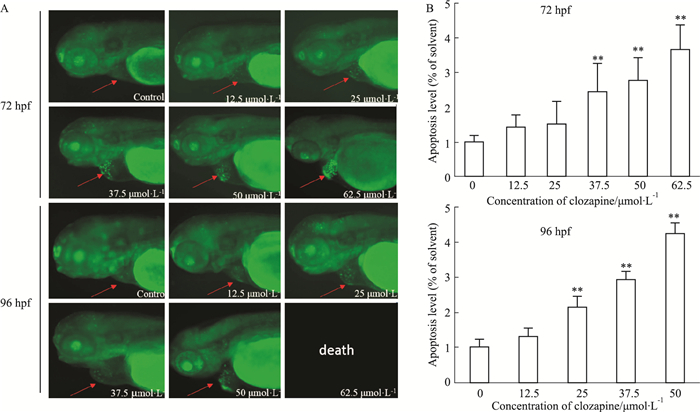 Protective effect of rhein on aristolochic acid-induced renal injury in zebrafish[J]. Chin Pharmacol Bull, 2016, 32(3): 361-5. 许冰洁, 张立将, 李春启, 等. 斑马鱼胚胎评价5种药物的发育毒性与模型验证[J]. 中国药理学通报, 2016, 32(1): 74-9. Xu B J, Zhang L J, Li C Q, et al. Model validation and evaluation of developmental toxicity of five drugs using zebrafish embryos[J]. Chin Pharmacol Bull, 2016, 32(1): 74-9. McGrath P, Li C Q. Zebrafish: a predictive model for assessing drug-induced toxicity[J]. Drug Discov Today, 2008, 13(9): 394-401. 罗涛, 万普蓉, 张咏梅, 等. 氯氮平急性中毒的临床表现和处理[J]. 临床精神医学杂志, 2017, 27(1): 68-9. Luo T, Wan P R, Zhang Y M, et al. Clinical manifestation and management of acute poisoning by clozapine[J]. J Clin Psychiatry, 2017, 27(1): 68-9. 张洁, 张宝生, 田韶辉, 等. 长期服用氯氮平对患者心肌酶的影响[J]. 中国民族民间医药, 2014, 23(7): 88-9. Zhang J, Zhang B S, Tian S H, et al. Long-term use of clozapine myocardial enzymes in patients with the result analysis[J]. Chin J Ethnomed Ethnopharm, 2014, 23(7): 88-9. 赵芳霞, 王怀海, 何宏. 氯氮平致心包与胸腔积液1例[J]. 临床精神医学杂志, 2010, 20(6): 382. Zhao F X, Wang H H, He H. 1 case of pericardial effusion and pleural effusion caused by clozapine[J]. J Clin Psychiatry, 2010, 20(6): 382. 韩利文, 赵亮, 楚杰, 等. 采用GC-MS代谢组学技术表征阿司咪唑诱导斑马鱼心脏毒性的内源性代谢物[J]. 中国药学杂志, 2015, 50(1): 45-50. Han L W, Zhao L, Chu J, et al. Endogenous metabolites investigation of cadiotoxicity induced by astemizole on zebrafish using GC-MS metabonomics[J]. Chin Pharm J, 2015, 50(1): 45-50. 吴晓敏, 何秋霞, 韩利文, 等. 阿司咪唑对斑马鱼心脏毒性的初步研究[J]. 中国药理学通报, 2013, 29(9): 1251-4. Wu X M, He Q X, Han L W, et al. Preliminary study of astemizole's cardiotoxicity to zebrafish[J]. Chin Pharmacol Bull, 2013, 29(9): 1251-4. 郑锡基, 马继红, 赵雪庆, 等. 氯氮平致严重心脏毒性反应2例[J]. 临床精神医学杂志, 2002, 12(1): 62. Zheng X J, Ma J H, Zhao X Q, et al. 2 cases of severe cardiac toxicity induced by clozapine[J]. J Clin Psychiatry, 2002, 12(1): 62. Chinese Pharmacological Bulletin, 2018, 34(8): 1088-1093.